Abby, Michael, and Amelia did a thing tonight that I could hardly have conceived of at their age: they Skyped with Aunt Ali. 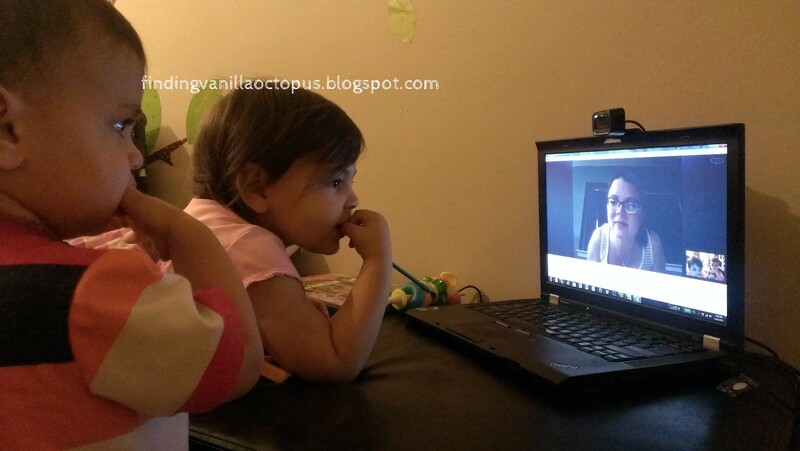 It's not the first time we've done it- Abby briefly joined in on a Google Hangout with Tom to talk to me while they were both away for a weekend a couple of months ago, and we all set up a call with Aunt Ali just a couple of weeks ago that was marginally successful. However, it seems that tonight's session was when it all really began to make sense to the elder children. Abby was making casual conversation as comfortably as she would in-person. Even Michael was responding as he would have to an actual encounter: bashful at first, near-flirty by the end. We dragged out our goodbyes a good two minutes longer than we should have, enthralled as we all were with the kisses he blew enthusiastically, and continually, until the end. We've come so far from the days in which Abby would confusedly wave at the telephone when asked to say "bye bye." I'm not sure whether to allow the thought of that to frighten me. It's inconceivable to me the number of gadgets that all of the children have been exposed to in their very short lives; even more inconceivable to consider how many more they'll have added to their arsenals (with great ease, no doubt), by the time they've lived as long as I have. And they'll never have known any other reality. I hope that somehow, they'll still manage to appreciate all of the magic that lies ever at their fingertips. And I hope that I can keep up with it all.